To minimize your hydrogen inventory, consider installing an electrolyzer rather than using cylinders. To prevent the possibility of having hydrogen pumped into a non-ventilated space, you should configure the electrolyzer to shut down if: 1) there is a ventilation system outage, or 2) a laboratory sensor detects hydrogen in the air. The laboratory ventilation system should maintain an air exchange rate that is at least two orders of magnitude greater than the maximum hydrogen generation rate of the electrolyzer to prevent the buildup of an LFL atmosphere. Oxygen exhausted by the electrolyzer should be safely vented to the outside. 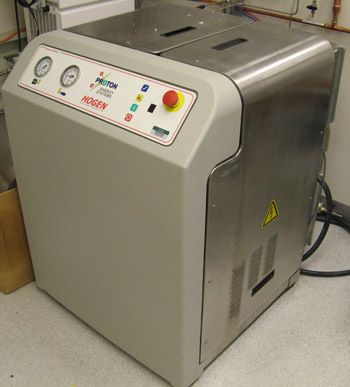 An electrolyzer should only be operated in a non-explosive environment.